The first American soldier to die in Afghanistan fell at the hands of a 14-year-old. 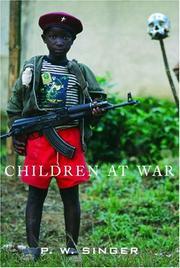 So writes Singer (Brookings Institution) in this dry treatment of a compelling subject: the growing use of children as soldiers. That 14-year-old sniper was one of tens of thousands of child soldiers fighting across the globe today. More than 11,000, Singer estimates, are fighting in Colombia’s ongoing civil war alone; one of four rebels is under the age of 18, “with the youngest recruited being seven years old.” Around the world—but, curiously, with epicenters along the equator in such places such as Myanmar, Sierra Leone and Colombia—these children are employed as cannon fodder. In a spectacularly gruesome example from 1984, Iranian boys were taken from school and, armed with grenades and wearing keys around their necks to unlock the gates of heaven, were sent off against Saddam Hussein’s regular Iraqi army; as many as 100,000 died in the ensuing human-wave assaults. (The Iranian government, Singer writes, rejected the repatriation of young prisoners: “They are not Iranian children,” said the Ayatollah Khomeini. “Ours have gone to Paradise and we shall see them there.”) Some children’s fanatical urges allow them to be recruited, but more, it appears, join the fighting in order to eat. Many, too, join to avenge the deaths of family members, as so often occurred in Bosnia and Kosovo and, more recently, in Afghanistan, where boys are thought not to become men until they slay those who have wronged them. Singer’s material is thorough and sobering, and his analysis of the psychological effects of child soldiering not only on the children but also on the adults—including, now, American soldiers—who kill them in combat has obvious implications for policy planners. Still, the tone is academic, limited in appeal to general readers. A shame, considering that Guantánamo Bay is now packed with teenagers, on both sides of the wire.